WASHINGTON (May 15, 2015) -- Army research to reduce the use of fuel and water, and to reduce waste output at forward operating bases, or FOBs, promises to dramatically reduce the number of convoys and hours Soldiers are exposed to threats. 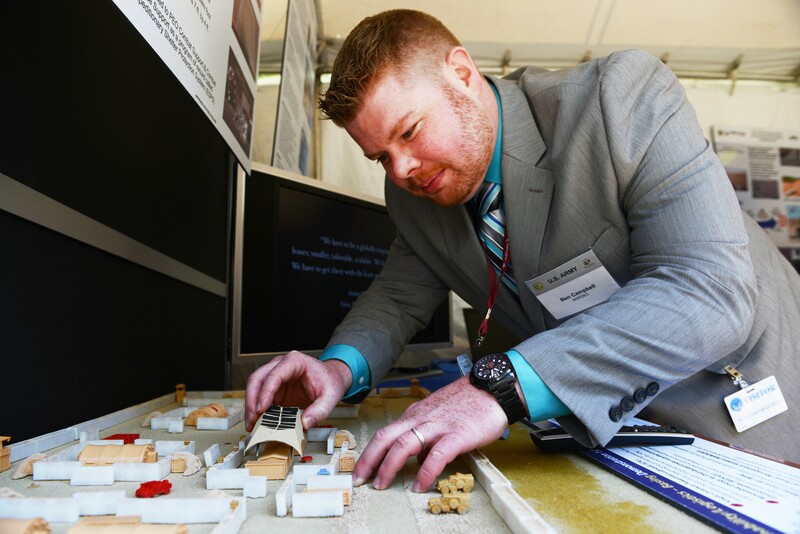 About 60 new technologies are being tested as part of a sustainability project that was on display at the Pentagon, May 14, at the first "DOD Lab Day" there. Dozens of Army researchers and scientists from Army labs around the nation put their most interesting research projects on display for viewing by Pentagon officials and the press. Ben Campbell, of U.S. Army Natick Soldier Research, Development, & Engineering Center, is the lead systems engineer of the Army's Sustainability Logistics Basing - Science and Technology Objective Demonstration. During the DOD Lab Day, May 14, 2015, at the Pentagon, he discussed some of the technologies his team is evaluating to reduce fuel use and water use on Army installations. In the courtyard of the Pentagon, he had a small model of an Army base camp, one that would house about 50 Soldiers, labeled to indicate where several of the technologies his team is evaluating for the Army might be put to use. Ben Campbell of U.S. Army Natick Soldier Research, Development, & Engineering Center, is the lead systems engineer of the Army's Sustainability Logistics Basing - Science and Technology Objective Demonstration. In the courtyard of the Pentagon, he had a small model of an Army base camp, one that would house about 50 Soldiers, labeled to indicate where several of the technologies his team is evaluating for the Army might be put to use. Included among those was a system that pulls drinking water from the air, a nanogrid power management system, bidirectional on-board vehicle power systems and shading systems to reduce the amount of power needed to cool shelters. Campbell said Army goals for the research he leads is to reduce fuel resupply to such installations by 25 percent, reduce water resupply by 75 percent, and reduce waste generation and waste backhaul -- the need to remove waste material -- by 50 percent. The 60 technologies being developed are meant to support these goals, Campbell said, and his team put them into realistic scenarios, such as at a recent demonstration at Fort Leonard Wood, Missouri, in April -- where they outfitted a 1,000-man base camp with such technology. At Fort Leonard Wood, they evaluated a new kitchen concept that feeds 80 Soldiers three meals a day. The new kitchen, he said, is more energy efficient -- it puts more heat into the food rather than into the kitchen environment where it not only makes Soldiers working there uncomfortable, but also wastes energy, he said. His team's technologies have proven successful in one of the Army's most primary goals -- keeping Soldiers out of harms' way, Campbell said. "Our initial analysis in one base camp scenario we had set up was almost a half a million Soldier threat exposure hours we are able to eliminate in a 180-day base camp scenario," Campbell said. One goal of water-saving, energy-saving and waste-reduction technology is to reduce the need for Soldiers to bring those things to a forward operating base via convoy. If an Army FOB can implement technology that allows it to use a quarter of the fuel it might otherwise use, or reduce the fresh water it needs delivered by 75 percent, then it will reduce the need to have convoys to deliver those supplies. For every four fuel convoys it might have needed before, it now only needs three. And it might need only one water convoy where before it needed four. That means fewer Soldiers on the road in convoys, where they are exposed to improvised explosive devices and other threats. Another benefit, Campbell said, is that by reducing the logistical support requirements for an installation, it can be moved farther away from a logistics supply base. A FOB could be moved father out, closer to the fight. "Resupply by air drop becomes more economically feasible and things of that nature," he said. "If you only need resupply every seven days instead of three days, then maybe you can have the base more forward deployed." With more energy- and water-efficient installations, fewer Soldiers on a FOB are involved in sustainment, Campbell said. "The more self-sufficient you can make the base camp, the more independent they can be," he said. "That means more Soldiers doing the mission rather than supporting the base camp. And it's reducing Soldier threat exposure hours; saving Soldier lives by being able to eliminate truck convoys. That's why Soldiers should care. It's a force enabler." Among the technologies that Campbell said are being evaluated by his team are those that recycle waste water, those that burn trash to create energy, and one that allows a tactical vehicle to be used to provide power to an installation until generators can be brought in. Campbell also said that while working toward the water, energy and waste goals are important, equally important is sustaining quality of life for Soldiers -- something he said has to be maintained. "The base camp is a platform to support Soldier readiness," he said. "A Soldier comes here to rest, reset, and launch missions off of. So we conduct evaluations to understand the impact of these technologies in generating quality of life support for the base camp. We could meet our water metric if we said instead of ten-minute showers, shower every other day. But what does that do to a Soldier's quality of life? We make sure the technologies we put into the camp are enablers of the Soldiers." Campbell's team is planning another evaluation at Fort Devens, Massachusetts, in July. There they will outfit one of two 150-person base camps with their technology to evaluate its effectiveness.